Make French and English a part of your life! The Office of the Commissioner of Official Languages of Canada has developed a variety of tools and resources for Canadian teachers and parents. These tools can be used in various subject areas, such as learning French or English as a first or second language, social studies and history. • This origami game will inspire you to do something in French! • Fun bilingual, printable colouring book consisting of 13 winter sports. Print, colour and learn the names of each sport in English and French. • Fun bilingual, printable colouring book consisting of 15 summer sports. Print, colour and learn the names of each sport in English and French. • Fun poster called Bilingualism at Work. The poster is 47 cm x 74 cm, a perfect size for classrooms and children's play areas or bedrooms. 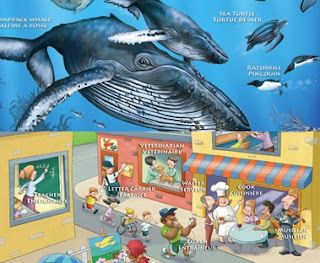 Illustrates a vibrant community setting with 15 great professions, titles in English and French, to help learn the names in both of Canada's official languages. The Bilingualism at Work poster is free, including shipping costs. • Beautiful Marine Life poster to help you and your students, children or colleagues explore the hidden wonders of the sea. Features 21 sea creatures that live beneath the ocean. Perfect size for any learning environment: 47.5 cm x 70.5 cm. The Marine Life poster is free, including shipping costs.